Behind the Beautiful Forevers is the first book from New Yorker writer Katherine Boo and won the 2012 National Book Award for Nonfiction writing. 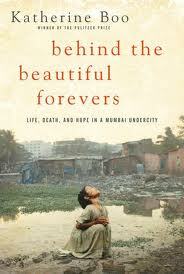 It carries the subtitle Life, Death and Hope in a Mumbai Undercity and Boo is an acclaimed chronicler of disadvantaged communities and notes at the conclusion that she first went into the Mumbai slum of Annawadi in Nov 2007 and completed reporting in Mar 2011. The depth of research that she put into the book very much comes through and the detail provided so well written that the book reads like a novel with the richness of characters (who she notes are all actual people who lived the events portrayed). One quibble I had reading the book was there were so many different people featured that it at times was hard to keep straight in my head who was part of which family and what the various relationships were. I found myself wishing there was a listing of each person at the beginning that I could refer back to while reading. That said, it really was a powerful work that takes a bad situation and seems to portray it for exactly what it is... something horrible that each person living it works to survive as best they know how. It was amazing reading of how cutthroat people can become when they have nothing and to make matters even worse, the people tasked with helping instead view those below them as marks to profit from. "Powerless individuals blamed other powerless individuals for what they lacked. Sometimes they tried to destroy one another. Sometimes, like Fatima, they destroyed themselves in the process. When they were fortunate, like Asha, they improved their lots by beggaring the life chances of other people." What made Behind the Beautiful Forevers so interesting to me was how Boo told matter of fact (and true) stories of people acting in ways that certainly weren't always admirable, but made sense given their lives born into and forced to navigate. People still tried to lift themselves up and improve their lot (which kept the book from simply being a long tale of despair), but the external forces seemed to be at best not helpful and at worst restrictive of those efforts. Some level of success could still be achieved, but often in spite of most everyone and everything around them.